The Rogue is a beautiful, secluded, whitewater-filled river with wildlife, solitude, fun rapids, convenient location and easy access. This all adds up to Rogue River rafting trips being among the world's best wilderness white water experiences. Over eighty playful and moderately challenging rapids and riffles fill the narrow confines of the Wild and Scenic Rogue River canyon, rendering some of the best whitewater rafting on earth. Most rapids here are energizing with splashy waves and fun drops. Scenic calms are found between rapids allowing time to soak in the sun and scenery. Overnights on the Rogue are equally rewarding. You can sleep in rustic, charming, and historic lodges or take advantage of our decadent camping set-ups fit for royalty. Either way, your Rogue river vacation is one that is sure to leave you with a lifetime of great memories! Rogue River rafting adventures take place in one of the most poetic canyons on earth and perfect for first-time river runners, families and experienced rafters alike. 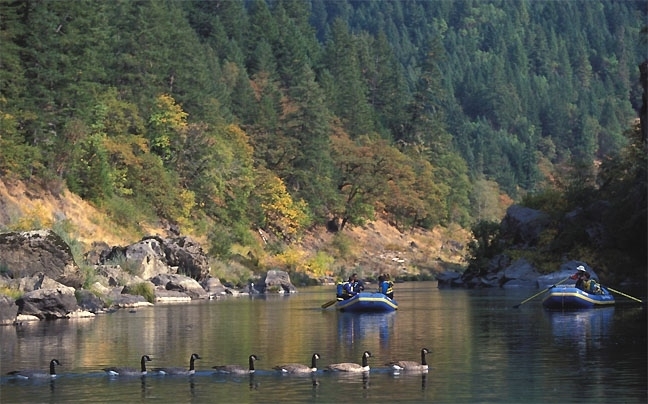 Destination Wilderness offers four different Rogue River rafting trip options to meet your needs. Choose from a Camp Trip or Lodge Trip. Combination trips are also available, where you can camp one or two nights and spend the night in the lodge on the other night(s). Regardless of whether you choose a lodge trip or decide to camp out, we are confident you will find your Rogue River rafting trip exciting and very rewarding. 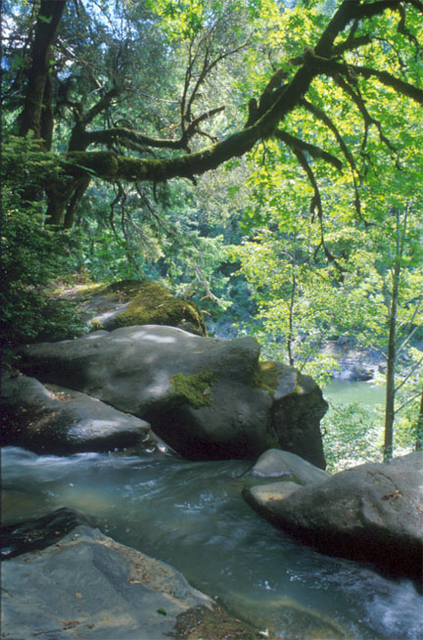 We also offer Rogue river hiking trips for those seeking to walk the world class Rogue river trail. These three and four day trips feature the same great scenery on foot or raft, with all of your overnight gear ferried down river in the boats. This leaves you essentially weight free to roam! The lodges are charming, cozy, historic, and friendly places tucked quietly in the trees above the river. The campsites, found on sandy beaches or in forest glades are also renowned. And, Destination Wilderness provides all camping gear on these trips. During your Rogue River rafting trip you’ll have opportunities to visit historic sites and cabins, such as Zane Grey's writing get-away. 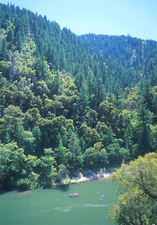 We invite you to join us in this special place called the Rogue River! On Oregon's Rogue River High Country Expeditions affiliate outfitter Destination Wilderness offers several different multi-day river rafting trip options to satisfy your thirst for Pacific Northwest adventure. Our trips begin and end with attention to your comfort, safety and satisfaction. Destination Wilderness offers a variety of Rogue trips: Three-day lodge trips, four-day camp trips, five-day camp trips, and camp-lodge combo trips. Our Rogue river rafting trips are outfitted with a variety of top-notch equipment and water craft to choose from, including: paddle rafts, oar boats and inflatable kayaks. Each of these crafts provides a unique way to float the calms and sachet through rapids. All of our trips include gourmet breakfasts, lunches and dinners for the duration of your trip. Our daily menus are equally diverse and impressive; you'll enjoy fresh breakfasts, gourmet deli-style lunches, satisfying happy hour snacks and beverages and dinners that even discriminating diners label first-class. We also provide all personal camping gear on camp trips, including tents, super thick and comfortable pads, and warm-flannel lined sleeping bags with santizied liners. The lodges provide all bedding and linens. Rogue River whitewater trips feature 34 miles of river and are perfect for people looking for adventure travel in the Pacific Northwest. This river is literally one of the best in the world for solitude, scenery, fun rapids, and wildlife viewing.